Researchers in China have genetically engineered monkeys to exhibit autistic-like behaviors, including impaired social skills and increased anxiety. This research is poised to improve our understanding of brain disorders, but ethicists say the harm endured by these monkeys is simply not worth it. Monkeys are increasingly being used as models for human diseases, and for good reason. Mice are extremely limited in their ability to model human cognition and behavior, while great apes are being phased out in research experiments. Humans and monkeys share a number of traits, including the capacity for attachment and empathy, communication, internalization of social rules, giving, trading, revenge, social maintenance, and attending to group boundaries. At the same time, recent advances in genomic technologies are making it possible for biologists to create transgenic monkeys with customized mutations. These “humanized” monkeys can conceivably model all sorts of human diseases, including schizophrenia, Alzheimer’s, and severe immune dysfunction. Now, a new study led by Qiang Sun and Zilong Qiu from the Institute of Neuroscience at the Shanghai Institutes for Biological Sciences demonstrates that it’s also possible to bioengineer monkeys with autistic-like behavioral characteristics. The details of their experiment can now be found in the latest edition of Nature. 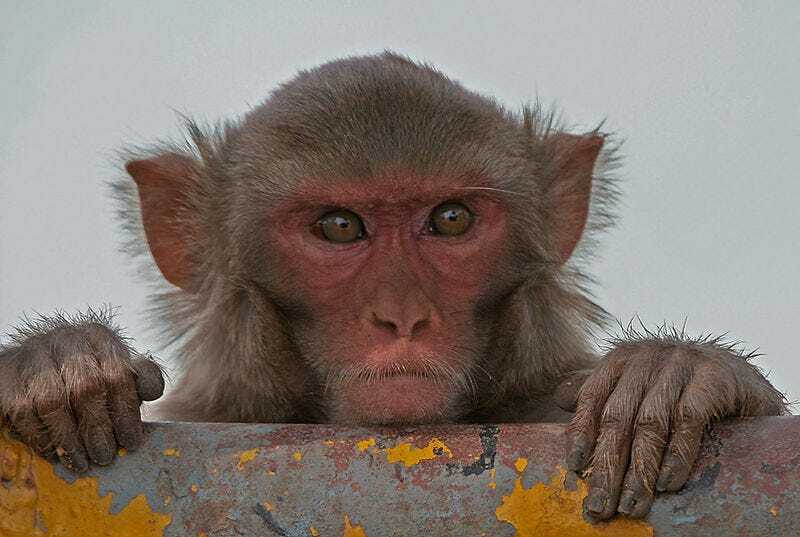 To create the transgenic monkeys, the researchers used a virus to deliver a modified human gene, MECP2, into the genome of long-tailed macaques, or Macaca fascicularis. The resulting monkeys exhibited autistic-like behaviors, including decreased social interaction, anxiety, and a tendency towards repetitive movements. The researchers also demonstrated that these genetic changes—along with the attendant behavioral changes—could be be passed down to the offspring of the modified monkeys. Scientists have been able to replicate the MECP2 mutation in mice, but it has been difficult to identify autism-like behaviors in mouse models. Macaques, on the other hand, are primates with highly evolved social and communication skills (long-tailed macaques are similar to toque macaques, recently featured in the Disney documentary, Monkey Kingdom). The purpose of the SIBS study was to deepen our understanding of autism spectrum disorder, but it led to some ethically dubious experiments. The researchers modified 53 macaque embryos and implanted them into 18 surrogate mothers. This produced eight live births—three male, five female — and four stillbirths. All the resulting monkeys were shown to carry the human MECP2 transgenes. The transgenic monkeys developed normally at first, but symptoms began appearing soon after they were one year old. In behavioral tests, the transgenic monkeys interacted less with both modified and unmodified monkeys within the same group. By 18 months, the transgenic monkeys began to display anxiety-associated behaviors that were significantly more pronounced than normal. The monkeys also exhibited repetitive body movement and various cognitive impairments. Essentially, the researchers succeeded in replicating Rett Syndrome—or a least a monkey version of it—in the macaques. Because primates share genetic, biological, and behavioral similarities with humans (macaques and humans share about 97.5 percent of the same genes), ethicists are calling for a phasing out of experiments on all primates.